In the scope of this week I’ve heard Minnesotans’ complain that it’s too cold (I had to break out the tights and winter running gear last week! ), too hot (it’s currently 95 degrees), too windy (it WAS crazy windy on Saturday). Well I’m here to say it’s ALWAYS gonna be “too something”. You can come up with a million and one excuses why you aren’t exercising, why you aren’t getting out of a dead end relationship, why you remain stuck in a job you hate, why you aren’t moving forward with what your heart tells you is right, etc. etc. 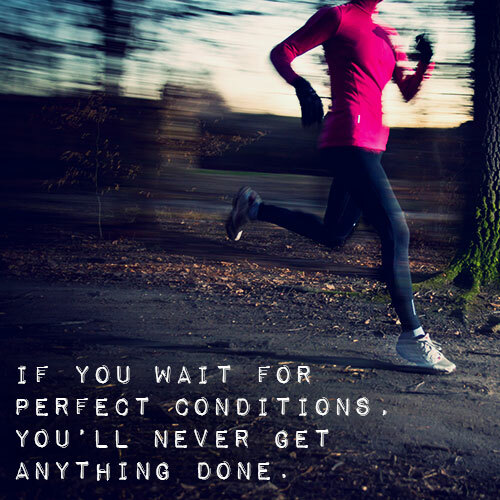 You have a choice to make – keep on making excuses and telling yourself that you’ll do IT (whatever your IT is) when the conditions are perfect. Or just take that first step towards IT, even in the face of imperfect conditions. I’m LOVING my running the past couple weeks. The miles are increasing. The legs are feeling strong and great all over. I can’t exactly explain it, but I’m feeling renewed and inspired by running. I’ve literally been going to bed the past few nights anxious to fall asleep so that I can hurry up and wake up and run. Love that feeling. Wheeee!